Born from our racing heritage, whereby model making mistakes could lead to misunderstandings for engineers and potentially a fatal chassis setup at the race track, our model makers are dedicated craftsmen with exacting standards - short time lines and accuracy is our specialty. Working to demanding schedules is routine. This elite group is capable of producing a prototype part or complete model from a verbal description, or from an engineering drawing, accurate to the smallest detail. The talents and services from this detail-oriented group are highly sought after by production, trucking, military, race teams, and other industries. For more information, contact ARC via e-mail or phone at 317-291-8600. 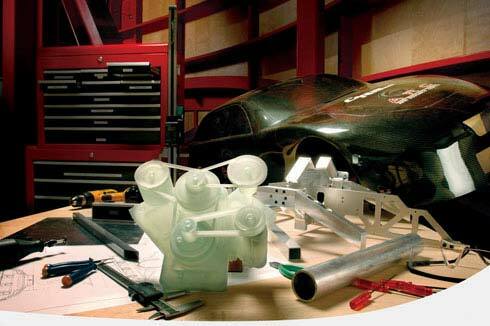 Rolling road, scale models are intricately detailed and their necessity for accuracy requires the most adept artisans. The ARC model makers rank amongst the finest in the industry. Currently, there is not a program of study to train the type of model makers employed by ARC. A broad range of shop skills, such as metal fabrication, machining, woodworking and composite techniques, are minimum requirements that are woven with an internal learning curve that allows ARC to boast the best scale model wind tunnel testing support in the business.